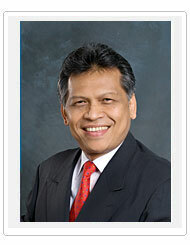 Dr. Surin Pitsuwan, born on 28 October 1949, is a native of Nakorn Sri Thammarat, Southern Thailand. He received his primary and secondary education in his home province and he got his higher education in the United States. He received his B.A. in Political Science in 1972 from Claremont Men’s College, California. Then he moved to Harvard University where he received his M.A. and Ph.D. in 1974 and 1982 respectively, in the fields of Political Science and Middle Eastern Studies (ASEAN, 2012). Dr. Pitsuwan was elected Member of Parliament from Nakhon Si Thammarat for the first time in 1986 and became Secretary to the Speaker of the House of Representatives the same year. In 1988, he was appointed Assistant Secretary to the Minister of Interior. From 1992 until 1995, he served as Deputy Minister of Foreign Affairs before becoming Minister of Foreign Affairs in 1997, serving in this capacity until 2001. 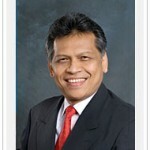 Dr. Pitsuwan was Chairman of the Association of South East Asian Nations (ASEAN) Regional Forum from 1999 until 2000 (ASEAN, 2012). During the interview, Dr. Surin shared his experience of forgiveness in government when he served as the Minister of Foreign Affairs. He states, “if a person makes a mistake you can’t discard him or her – everyone deserves a second chance. They just need motivation and support from the leaders.” Moreover, he argues that “respect is very important and everyone deserves to be treated with respect and dignity.” He explained that he didn’t regret any decision while he was in the cabinet, “When you approach your job from the perspective love, care and forgiveness, you can’t go wrong.” He added that his only regret is that he did not do enough; he did not make himself accessible enough to the people due to other responsibilities he had. Dr. Pitsuwan emphasizes two leaders that were particularly inspiring to him – Mahatma Gandhi and Nelson Mandela. He explains that the main ideas behind acting for love and forgiveness in governance are provided by religion and exposure to different cultures. Surin lived and attended schools in various parts of the world. This allowed him to experience different cultures, which significantly influenced his worldviews and his work. As a political leader, Dr. Pitsuwan has championed the values of democracy and human rights, and innovative solutions to the region’s complex, transnational problems. In 1998, soon after taking over as the foreign minister of Thailand, he challenged ASEAN to look beyond its traditional notions of non-intervention (Acharya, 2008). One of the well known achievements is the new idea he came up with, “flexible engagement”. The idea of flexible engagement was to motivate ASEAN not to shy away from commenting and acting collectively on problems that may arise from within the boundaries of one nation-state, but which may threaten regional and international stability and prosperity. It first emerged in Pitsuwan advocacy policy towards Myanmar. Dr. Surin new policy called for increasing interactions with Myanmar leaders when they took steps towards reforms, and building people-to-people contacts between nations. He worked and motivated the Myanmar military junta to open up politically. Based on his religious beliefs, Dr Surin has not ceased to promote dialogue between civilizations. After reading such an impressive profile, it is quite obvious that Dr. Surin Pitsuwan epitomizes what it represents to be a global leader with a servant attitude. Having lived all over the world, it is no surprise that Dr. Pitsuwan’s experiences have allowed him to see the world through a very open-minded lens where forgiveness and love are founding principles by which he interacts with others. His ability to forgive others and show them compassion because no one is perfect, and therefore everyone deserves a second chance is remarkable. As a result, it makes the world seem less indifferent and heartless and more caring and loving, thereby fostering respect, dignity and better dialogue among people. In the words of one of his inspiring mentors Nelson Mandela: “Resentment is like drinking poison and then hoping it will kill your enemies,” send a very strong message to the world that forgiveness, especially in governance is paramount if world peace and prosperity are to ever be possible.Therefore, it is important to forgive and move on especially in our interconnected world where political instability as well as numerous economic and societal problems continue to abound.